Beaker provides an inventory of Systems(these could be a physical machine, laptop, virtual guest, or resource) attached to lab controllers. Systems can be added, removed, have details changed, and be provisioned among other things. 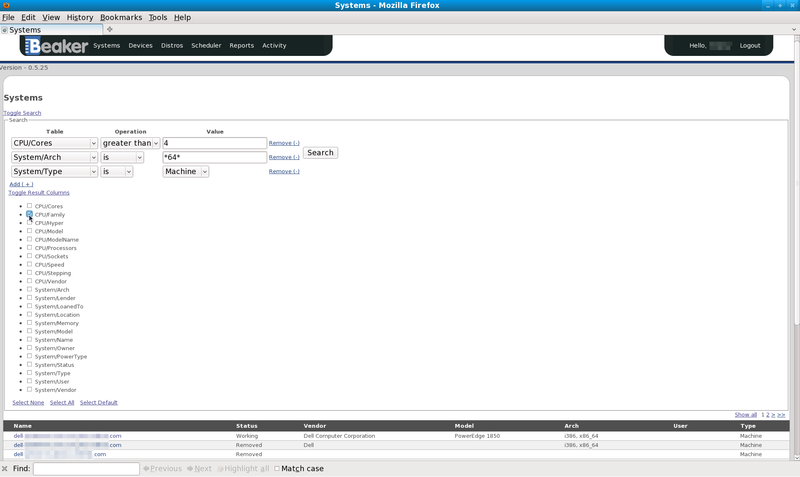 System searches are conducted by clicking on one of the items of the “System” menu at the top of the page. 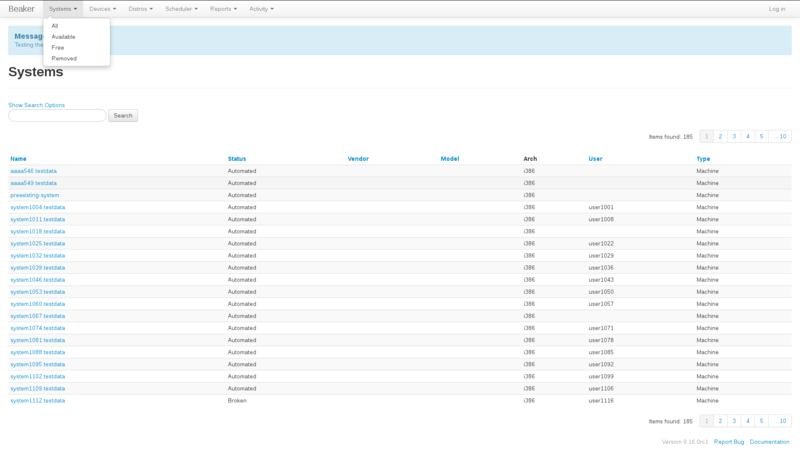 Will search through all existing Systems listed in Beaker (excluding systems which have been removed). Will search through only Systems that the currently logged in user has permission to reserve. Will search through only Systems that the currently logged in user has permission to reserve and are currently free. Will search through only Systems that have been removed. The search panel has two modes; simple and advanced. The simple search is the default, and the default search is of the System name, using the “contains” operator. To show the advanced search options, click Show Search Options. The first column (“Table”) is the attribute on which the search is being performed; The second (“Operation”) is the type of search, and the third (“Value”) is the actual value to search on. To add another search criteria (row), click the “Add(+)” link just below the “Table” column. When using more than just one search criteria, the default operation between the criteria is an SQL AND operation. The operators change depending on what type of attribute is being searched. No operator provides explicit wildcards other than the is operation, which allows the * wildcard when searching an attribute which is a string. The kind of data returned in the System search can be changed by adding/removing the result columns. To do this the “Toggle Result Columns” link is pressed and the columns checked/unchecked. Some systems may need a driver disk to be able to install certain releases. In order to use a driver disk you need to host the driver disk under the TFTP server so that it’s available during netboot. You also need to tell Beaker which families the driver disk is needed for. First step is to install the driver disk on your lab controller(s). The following example assumes tftpboot is under /var/lib/tftpboot; this is true for RHEL6 and newer distros. Make a directory to host the driver disk. Copy the driver disk to this directory. Second step is to set the family install options for the system that needs the driver disk. If you don’t have any arch specific install options you need to create one first. Install options are inherited in the order of Arch, Family, and Update. Adding a blank install option for arch. Once you have an arch specific entry you can create a family specific entry. 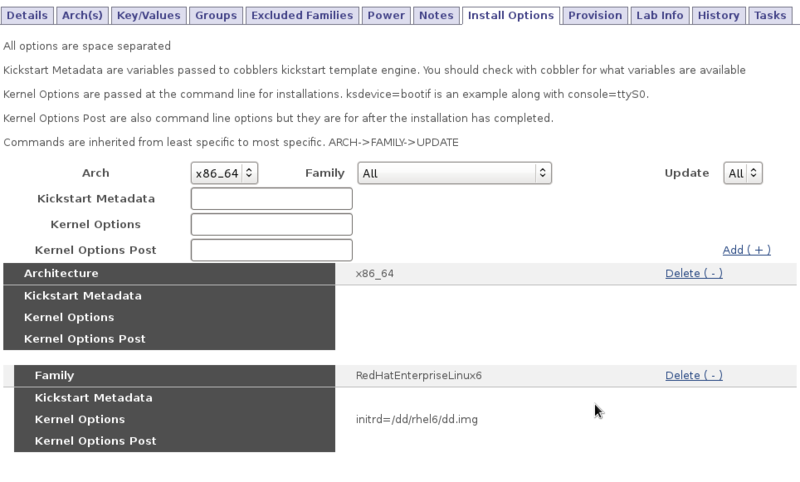 The image below shows adding the driver disk we created for RHEL6. Notice that the path is from the chroot of the tftpserver, not /var/lib/tftpboot/. Adding a driver disk entry for RHEL6. After finding a System in the search page, clicking on the System name will show the System details. To change these details, you must be logged in as either the owner of the System, or an admin. System Name: Unique hostname that identifies the machine, also referred to as FQDN (fully qualified domain name). Date Checkin: When the machine was added to the inventory. Lender: Name of the organization that has lent this system to beaker’s inventory. Serial Number: Serial Number of the machine. Automated: In a working state, can have jobs run against it. Manual: In a working state, can not have jobs run against it (designed so people can test machine without having other people’s jobs run on it). Broken: Not in a working state and not available to have jobs run on it. Removed: System no longer exists in the inventory. Secret: Stops other people from seeing this system in the inventory. Lab Controller: The Lab controller to which it is connected. Machine: A physical machine that does not fit the other categories. Virtual: A virtual machine, this is just a placeholder that has a hostname and MAC address that corresponds to a DHCP record. Resource: Something which is not a computer. i.e a monitor. Prototype: New piece of hardware. Last Modification: The last time the system details were changed. Loaned To: The current Loanee. See Loans. MAC Address: The MAC address of the network device. Shows the details of the System’s CPU, as well as Devices attached to the System. Shows the architectures supported by the system. Shows the groups of which this System is a member. Control the level of permission granted to other Beaker users for this system. See Access policies. Are the list of Distros that this System does not support. Perform remote power operations, as well as clear an existing netboot entry. Update a system’s power configuration. Only available if you have the correct permissions. Any info about the system that you want others to see and doesn’t fit in anywhere else. If you have admin rights over the system you will be able to add and delete notes, as well as show previously deleted notes. These are default options which will be used when a system is provisioned. You can create different options per Arch/Distro combination. See Install options for details about the meaning of these options. Allows the user of this System to install a Distro on it. Will display practical details of the System like cost, power usage, weight etc. 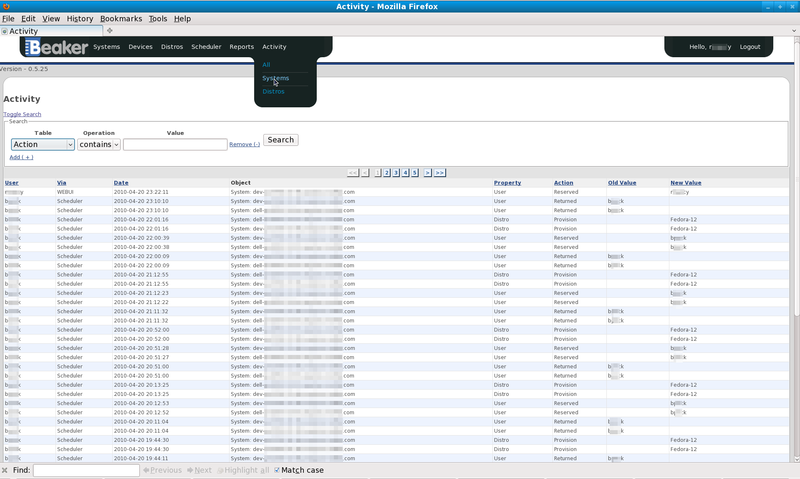 Shows the activity on this System for the duration of the systems life as an inventory item in Beaker. These activities can also be searched. By default, the simple search does a “contains” search on the Field attribute. Please see System searching for details on searching. To search through the historical activity of all Systems, navigate to “Activity>Systems” at the top of the page. To search the history of a specific system, you can also use the “History” tab on the system page. See System details tabs.